With 1, 3, and 5 being defective together, that means they are on the same gene. 3 and 5 are defective together too, meaning they are on the same gene as 1. Why does this slide say that there are 3 mutated genes? I must be missing something, I don't think I understand something. There are 5 mutations being tested in these complementation test. The first gene, carries mutation number 2. In other words, mutation number 2 complements mutations, 1, 3, 4, and 5, and fails to complement itself. The second gene, carries mutation number 4. In other words, mutation number 4 complements mutations 1, 2, 3, and 5, and fails to complement itself. The third of the three genes, carries mutation 1, in one strain, mutation 3, in a second strain, and mutation 5, in a third strain. In other words, mutations 1, 3, and 5 all fail to complement each other, yet all three complement mutations 2 and 4. 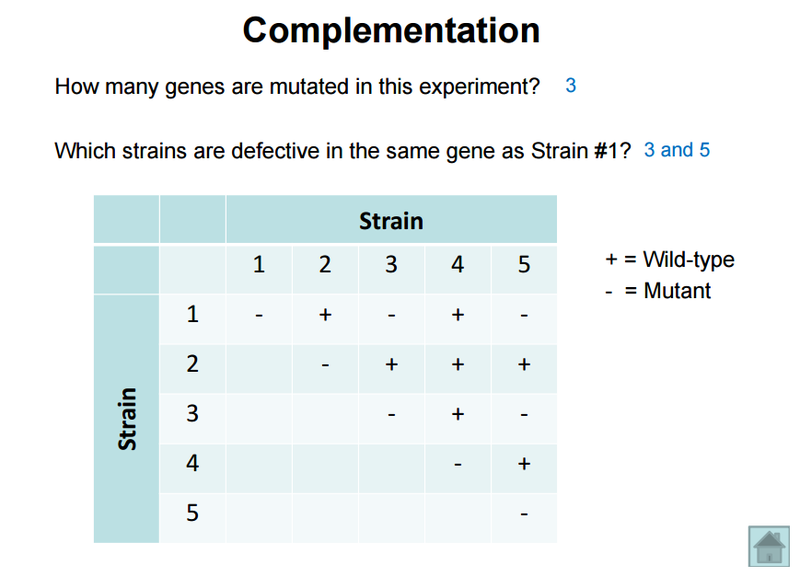 There are 5 different strains in this experiment, and there are five different mutations (one in each strain), but the five mutations only affect three different genes.